Think interest rates only impact fixed income investors? Think again. It is stock market investors who are feeling the biggest impact. The bond yield across the yield curve is set to move higher but not for the right reasons. Rising bond yields at the first part of an economic cycle isn’t necessarily bad as long as it’s combined with good earnings and revenue growth and we have certainly seen that come through in equity markets while interest rates have been so low. But from here on there may be a larger impact by rates and bond yields on the valuations of equities. If earnings and revenue aren’t growing fast enough to outpace the slowing effect of rising rates, it can be a bit more of a challenging environment for equity investors. The Fed is triggering a rise in Treasury interest rates as it hikes rates and unwinds its $4.5 trillion balance sheet. The central bank has increased the federal funds rate eight times as a growing economy justified a move away from crisis-response policy since December 2015. The 10 year UST yield is up a whopping 36 percent over the last 14 months. The Fed will almost certainly increase Treasury interest rates in December, and has signaled a strong preference to do so a few more times in 2019. Federal Reserve officials are currently divided on the number of rate hikes in 2019. The Fed could pause its rate hikes in 2019 following the dramatic -20% plunge in oil prices and falling house prices. We saw furniture sales get hit in Q3 2018 earnings season which suggests that the drop in home sales from higher mortgage rates is starting to bleed through into other sectors of the economy. Because bonds and equities were equally propped up by Fed intervention, they’ve been equally vulnerable to the opposite effect as Fed policy unwinds. But factors that go beyond the Fed have also pushed yields higher. The global supply of bonds is on the rise while global demand is falling. That oversupply of bonds means that governments and corporations will have to offer higher bond yields in order to attract investing dollars. We are seeing demand for riskier high yield corporate bonds completely collapse as oversupply floods the market. A bond trader I know said that liquidity has dried up so much in high yield corporate bonds that most of the action now is just price quotes. I predict that bond yields will rise globally as the European Central Bank is done with their QE. The ECB has stated it would end its massive bond-buying quantitative easing program in December 2018, removing lots of demand from the global bond market. Japan’s Bank has tapered a number of its stimulating bond purchases. The drop in oil prices in November has also contributed to the weakness in bonds as many energy companies borrow money via corporate bonds to pay for drilling exploration. These energy companies use oil sales to pay back corporate bond holders. As the price of oil drops, corporate bond investors worry about if they will get paid back. As a result, these bond investors demand a higher yield for the added risk of default from the falling price of oil. Italy’s central bank has sounded the alarm over the country’s rising bond yield, warning that they are set to cost the nation billions annually in additional interest payments on its debt and could threaten the stability of banks and insurers. The reduction of bond-buying monetary stimulus reduces demand and pushes prices down and yields higher. Yields move inversely to bond prices. We already have a huge oversupply of U.S. Treasury bonds that is overwhelming buyers. We have Japanese and European investors which are not buying U.S. Treasury bonds because the expense of hedging out currency differences from the rising U.S. dollar have completely wiped out any premium. We are seeing the biggest increase in excess supply of bonds since 2010 coupled with continued Fed rate hikes which are tightening financial conditions. A considerable rise in interest rates in 2019 is shaping up. In 2017, demand for bonds came in at $800 billion. JPMorgan had anticipated a relatively little change in demand in 2018. However, following a inflow in January, bond demand after the market correction in January-February 2018 has been small and now JPMorgan forecasts that bond demand is at a $320 billion annualized pace. That’s a shortfall of $480 billion! JPMorgan expects a further reduction in bond demand in 2019 of about $350 billion. As shown below, in 2019 consolidated bond demand is going to be the lowest it’s been since 2008. On the bond supply side, JPMorgan expects a modest aggregate growth in bond supply. For U.S. Treasuries, the lender sees around $160 billion of increase in net issuance, including the effect of an expanded fiscal deficit as well as the increase in Fed balance sheet normalization. On aggregate, JPMorgan expects net bond supply to increase by approximately $130 billion. The combination of a $350 billion deterioration in bond demand and a $130 billion increase in bond supply leaves investors concerned where rates are headed in 2019. With an oversupply of bonds on the market, it pushes the bond price down and the bond yield higher. The only way to get more bond demand is for the bond yield to go up (bond investors must be motivated to buy from higher yields). The continuing deterioration in the bond supply/demand equilibrium for 2019 is set to put additional upside pressure on bond yields. As bond yields go up, the U.S. economy will slow even more. Rising bond yields are pushing up mortgage rates and corporate debt costs. The big hit to big-ticket purchases like houses doesn’t bode well for the economy. Worse, corporations have feasted, amid low interest rates, on debt issuance. Total company debt that is outstanding is currently around $9 trillion! Already rising bond yields are pushing down the stock market. The technology sector has been under selling pressure after softer forward guidance. The weakness on the S&P 500 has further dampened sentiment for equities. Notice what the market downturns at the end of January 2018 and in October 2018 have in common. 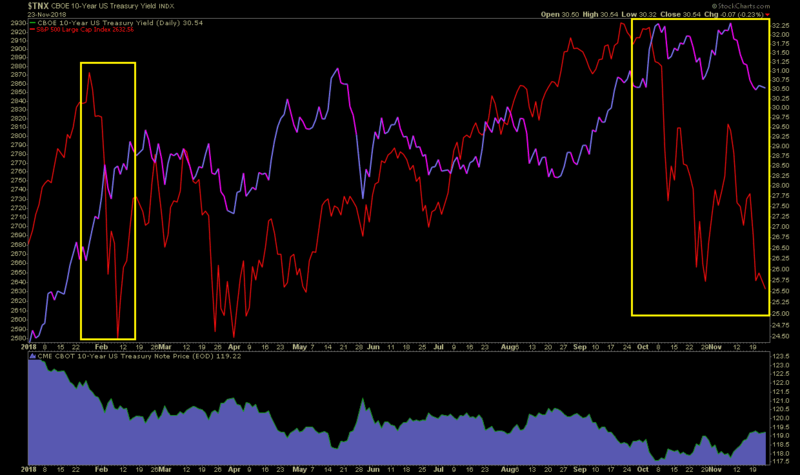 Each time bond yields spiked, the stock market has sold off. Because of rising mortgage rates, home sales are rapidly slowing down. Some investors are concerned that the drop in home sales might be an early sign of a recession. At the very least we can say that there’s a growing threat of recession in 2019 and 2020. The crazy thing is that usually investors buy bonds in a flight to safety. We are not seeing that this cycle. As volatility rose in October, investors pulled a net $14.2 billion in taxable bond funds, the worst month since December 2015. Another $7 billion was withdrawn by investors in the first two weeks of November. This in turn is currently pressuring credit spreads. The biggest thing that has happened with credit since the October 2018 correction is that liquidity has been greatly reduced, especially in corporate bonds. What could be causing investors to dump bonds is that a wave of “fallen angels” downgrades of BBB-rated corporate debt could overwhelm high yield debt markets as the economy slows and higher interest rates raise the debt burden. You should consider lightening up on equity exposure if you are overweight equities because that’s what institutional traders are doing right now. Buying utilities stocks could be a defensive play. Utilities are often good investments during times of decelerating GDP growth. We recommend underweighting Real Estate, Industrials, Materials, and Consumer Discretionary.